I've caught several 4+lbs on the most southern side of Whitman's even caught a 26in chain pickerel!! Awesome largemouth bass fishing.FISH ON!!!!!! Attention Bass Boat owners !!! 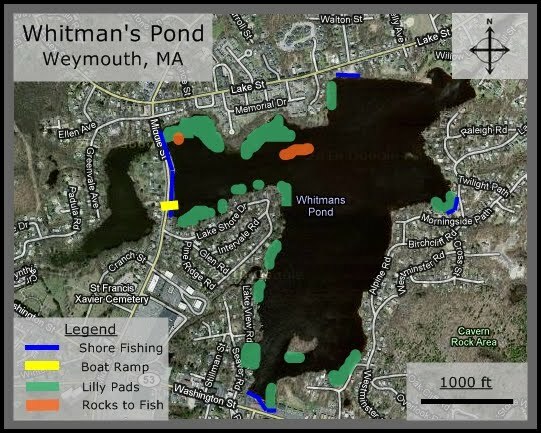 Whitmans Pond Association President Trish Prise is trying to ban power boats with Hp over 50!!! I grew up on the south side of the pond and have caught several 6 pond bass.this small part of the pond has some great fish and is good for kayak or canoe fishing ive caught largemouth bass,pickeral,perch,calico,sunfish,bullhead catfish and golden shiners ive also heard of carp being caught.